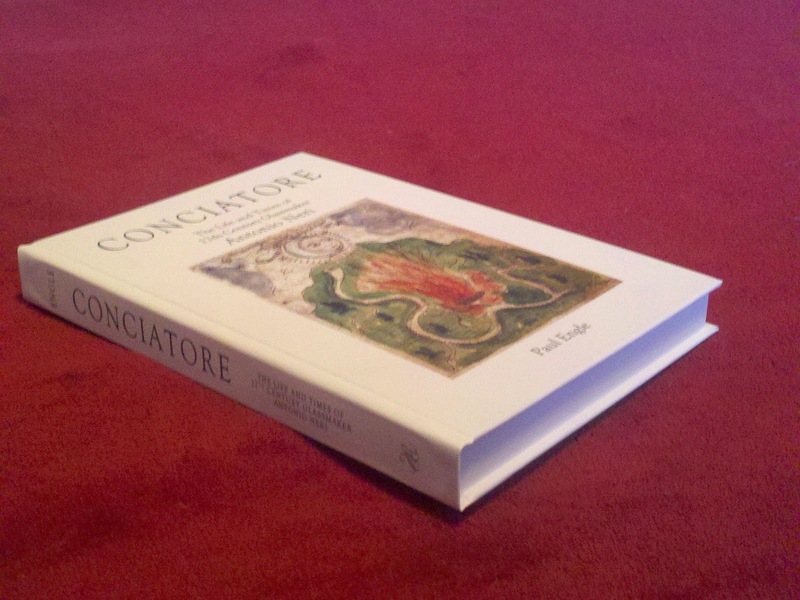 I am very pleased to announce the release of my new book, Conciatore, The Life and Times of 17th Century Glassmaker Antonio Neri. It is a biography of the man who, in 1612, wrote the first printed book on the art of glassmaking. Even today, his name is reasonably well-known to historians and glass artists alike, but until quite recently, Antonio Neri was considered by many to be something of an enigma. Today, he is revealed as a fascinating character living in extraordinary times. He was born the fourth of ten children in February of 1576. His father lead the physicians guild in Florence, Italy and served as the personal physician to Grand Duke Ferdinando de' Medici. Antonio entered Catholic seminary around the age of fifteen and immediately began training as an alchemist. By his early twenties, he was ordained as a priest and plying his craft for Medici prince Don Antonio in an exceptionally well-outfitted palace laboratory. "Conciatore" was the name used in Florence for specialists charged with preparing the raw materials that compose a batch of glass. Glassmaking was part of Neri's regular responsibilities and he eventually recorded his knowledge in his book L'Arte Vetraria, (in English known as The Art of Glass). It became an enduring classic handbook of glassmakers throughout Europe, eventually translated into five languages, in over two dozen editions. But Neri's interests ranged far wider than glass, his passions lay in medicinal cures and in the pursuit of the philosopher's stone; a substance thought to cure disease and transmute base metals into gold. In the rush toward modern science, Neri's manuscripts on alchemy were relegated to dusty shelves and largely forgotten. When we dig them out and brush them off, what we find is the thoughtful work of a careful experimenter. Neri and his contemporaries applied the Aristotelian principles of air, earth, water and fire to elucidate the secrets of nature. Their careful observations contributed to a more sophisticated understanding of the world in which we live. Alchemy was not overthrown by modern science as much as one evolved into the other. Join me in a celebration of early modern experimentalism; learn about the tools and methods used to prepare exotic glass formulations, artificial gems and more. Follow Neri's adventures from the palaces of Italy across Europe to the home of a wealthy merchant banker. Read an account of his evasion of thugs who hounded him for the secret to make gold. Get a sense of what it was like to live four-hundred years ago through vivid narrative and more than a hundred full color illustrations. Casual readers will find a lively story tracing the arc of Neri's life, the places he lived and the social atmosphere of his time. The serious scholar will find a wealth of new material about Neri and his family, all carefully documented. Whether you are just looking for a good read or you thrive on digging into footnotes, I hope Conciatore is a book that will bring to you a taste of the enjoyment I found in pulling back the curtain on a very interesting life.